So here it is, the promised post on the ultraviolet catastrophe. Blackbody radiation is simply a type of thermal radiation that is given off by certain types of materials, ones that absorb all thermal radiation they are exposed to, and reflect none of it. As it is the radiation that is reflected by a material that defines its colour, these materials have no colour, that is, they are black, hence their name. They are called blackbodies. It is common experience that when items are heated, they glow, they emit radiation and not just radiation that we can see, they emit radiation across the whole spectrum. The signature that is emitted depends upon what the material is made of, however the signature of the radiation emitted by all blackbodies is identical, regardless of the material they are made. 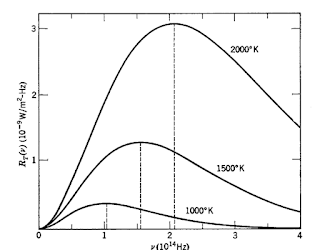 The above graph gives the signature of blackbody radiation for a blackbody at three different temperatures 1000K, 1500K and 2000K as a function of frequency of the radiation emitted. The value on the y-axis, RT(v), is called spectral radiancy, which is defined such that RT(v) dv is equal to the energy emitted per unit time in radiation of frequency within the interval v to v + dv from a unit area of the surface at a temperature T.
Other than objects which have no colour, there are other entities that can behave as if they were blackbodies. One example is a hollow object which has a very small hole leading to the void inside of it. Radiation incident upon this hole will be wholly absorbed if the internal surface area of the void inside the object is large compared to the size of the hole. Thus, if the hole absorbs all thermal radiation that happens to be incident upon it, then it is behaving exactly as if it were a blackbody. It is not too much of a leap from the behaviour explained above to see that if the objected is heated some of the thermal radiation emitted from the surface of void will pass through the whole and therefore this emitted radiation will bear a blackbody signature - the hoe acts as a blackbody. However, as the radiation emitted through the hole is just a sample of the thermal radiation inside of the void, then the thermal radiation inside the hole must also bear a blackbody signature. So, there you go, blackbody radiation in a nutshell. So where does the ultraviolet catastrophe fit into all of this. Well it comes about in efforts to predict the the signature of the blackbody radiation. This equation is called the Rayleigh-Jeans formula for blackbody radiation. It gives the energy per unit volume of the cavity at temperature T in the frequency interval v to v + dv. 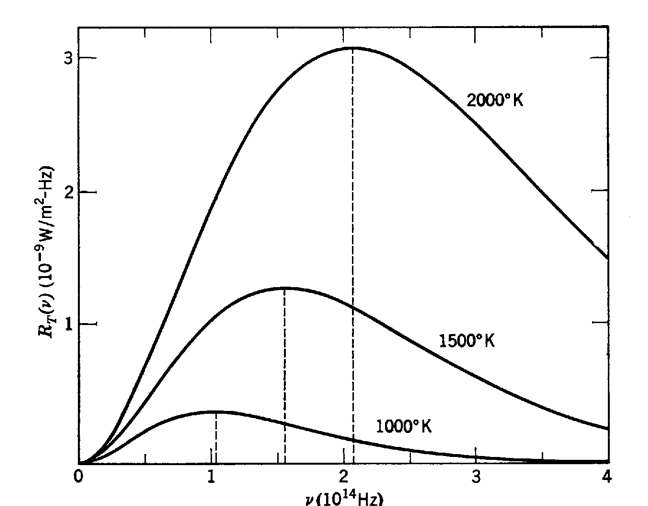 It can be seen that the energy density, as calculated by the above equation, is dependant upon the square of the frequency of the radiation, and as such, as the frequency increases the calculated energy density also increases. However, this is at odds with the signature of blackbody radiation which, as frequency increases, increases to a peak then falls back. It is the failure of the Rayleigh-Jeans formula to correctly predict the signature of blackbody radiation that is known in physics as the ultraviolet catastrophe. Studies have had to take a back seat for the past few months, life has got in the way. I've moved house and had to do all the things that this entails, include a fair amount of re-decorating, I've been extremely busy at work, working toward the first flight of the product I'm working on. However, as I'm now much more settled in to the new house, and I'm going to be less busy at work, I should have some more time to study. In fact, I have in the last couple of days read some of the first chapter of Eisberg & Resnick and came across a phrase that I don't think I ever came across while studying my degree (or perhaps I have just forgotten it), the 'ultraviolet catastrophe' - one of the reasons behind the need for QM, and as so I think I should do a more in depth blog post about it at some point in the future.